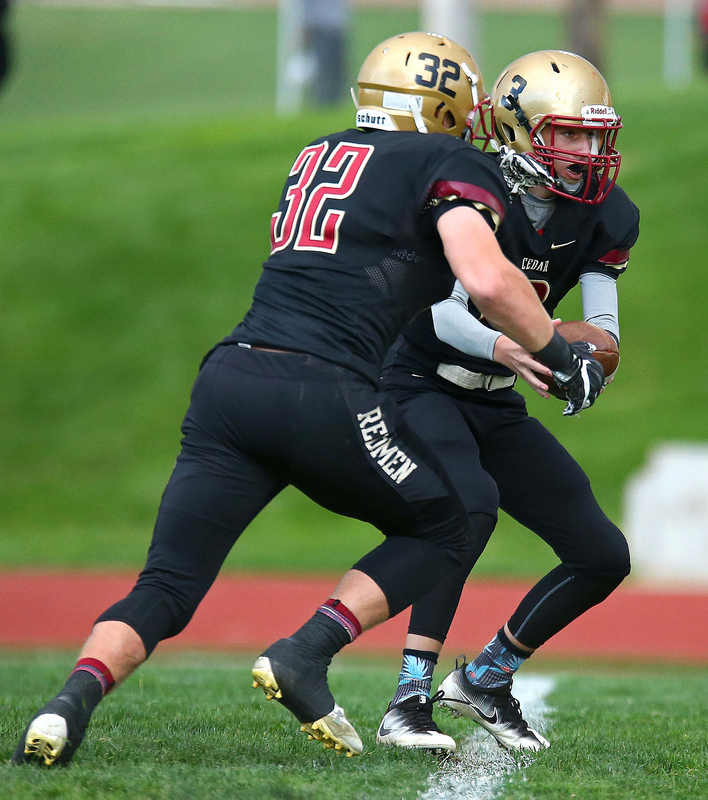 CEDAR CITY – Jacob Barben played. Boy did he play. With Dixie having already clinched the Region 9 championship, many fans speculated that Barben may sit out the season finale against Cedar to avoid injury. 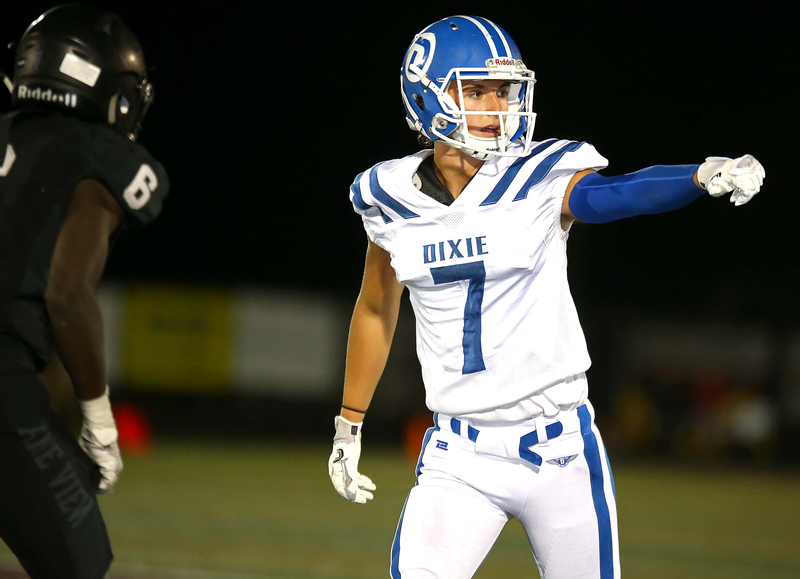 But the senior quarterback went 19 for 30 for 350 yards and four touchdowns in the first half alone, leading the Dixie Flyers to a 44-26 win over the Redmen Thursday night. Barben was a question to start the game. A year ago, he was injured in the final regular season game and was out for the playoffs. Since Dixie had already clinched the Region 9 title with a win last week, no one would have blamed Stokes if he sat his star QB. Stokes, however, decided to play Barben and was adamant it was the right decision. The decision paid off early for the Flyers. After Barben missed receiver Payden Harrah on the first play of the game, the two connected on the next play for an 80-yard touchdown pass. With only 18 seconds off the clock, the Flyers held an early 7-0 lead. Barben would find Harrah on the next drive as well for a 20-yard gain, giving Barben 100 passing yards on only two completions. Five plays later, Barben would find Harrah again in the end zone, but a chop-block penalty took away the touchdown. Barben would find Nate Mahi in the end zone two plays later to give the Flyers a 14-0 lead with 7:22 left in the first quarter. Cedar would answer back on the next Dixie drive as Markus Johnson picked off a Barben pass intended for Flyers star playmaker Hobbs Nyberg. Johnson took the interception 30 yards for the first Redmen score of the game. Dixie led 14-7 with 1:22 left in the first quarter. 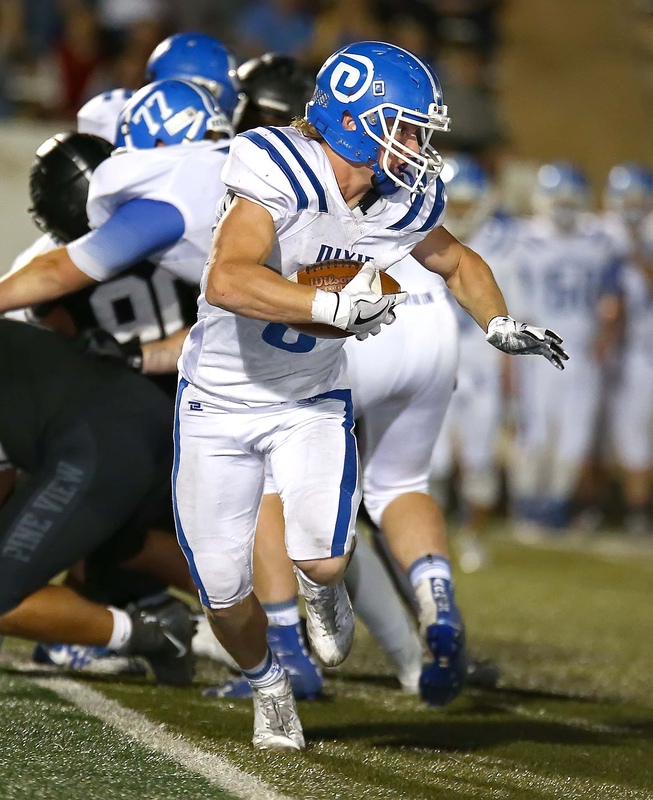 Dixie would run their only two official running plays of the first half on the next drive, with Nyberg gaining a total of 10 yards on the runs. Barben and Harrah continued to be in sync, connecting for a 21-yard gain, and later an 8-yard touchdown pass to give the Flyers a 21-7 lead with 11:18 left in the first half. After the Flyers kicked a 27-yard field goal to extend the lead to 24-7, the Redmen needed to answer. However, Trenton Maurer and Jaxon Garrett were unable to lead the Redmen downfield on the drive, and were forced to give the Flyers the ball back on the 45-yard line with 1:39 left in the half. Barben was able to march the Flyers downfield, but faced a fourth-and-2 from the Cedar 15-yard line with only seconds to go in the half. Stokes knew right away what he wanted his team to do. Barben dropped back and fired a high-arching pass in the direction of Nyberg. The senior ran a beautiful curl route into the end zone and came down with his first touchdown of the game, giving the Flyers a 30-7 lead going into halftime. The Flyers filled the stat sheet in the first half. Barben threw for 350 yards, while Harrah finished the first half with seven receptions for 219 yards and two touchdowns. Nyberg had three receptions for 63 yards and a touchdown. The Flyers would then sit most of their starters in the second half so they could go into the playoffs healthy. Stokes and Nyberg said they were excited for Barben, who now gets to start a game in the playoffs. The Redmen made an attempt at a second-half comeback, but it was a tall task to take on. After forcing the Flyers into their first three-and-out of the game, Garrett led the Redmen on a nine-play drive that ended with him throwing an 8-yard strike to Ezra Lata. The Redmen only trailed by 30-14 with 2:27 left in the third quarter. The Flyers, however, refused to go quietly. On the next Flyers play, backup quarterback Reggie Graff pitched the ball to Nyberg, who turned on the afterburners for a 65-yard touchdown run, giving the Flyers a 37-14 lead with 2:12 left in the third quarter. The Redmen would answer on the next drive. Garrett had not had a designed run come his way all night, but took a read-option on his own for a 12-yard, untouched touchdown run. The Redmen would fail on the two-point conversion, and trailed 37-20 with 11:31 left in the game. Maurer would find the end zone on a 5-yard touchdown run with 5:05 left in the game. The two-point conversion would fail once again, but the Redmen suddenly saw themselves down just 37-26. On the ensuing Flyers possession, Graff would find Mahi for a long gain, sealing the win for the Flyers. Preston Moore iced the game with a 24-yard touchdown run of his own with 2:42 left in the game. The Flyers were glad to hold on to the victory. Nyberg said the win was nice, but it does not matter anymore. With the win, the Flyers have back-to-back seasons undefeated in Region 9 play. They will host Park City, the No. 4 seed from Region 11, for the first round of the playoffs on Friday, Oct. 27, at 4 p.m.
With the loss, the Redmen risked missing out on the playoffs. But with Snow Canyon falling 28-21 to Desert Hills, the Redmen will enter the playoffs as the No. 4 seed from Region 9. They will travel to Region 11’s top team, Stansbury, next Friday at 4 p.m.